This box was provided gratis from Sihaya & Co in exchange for photographs. All opinions my own. 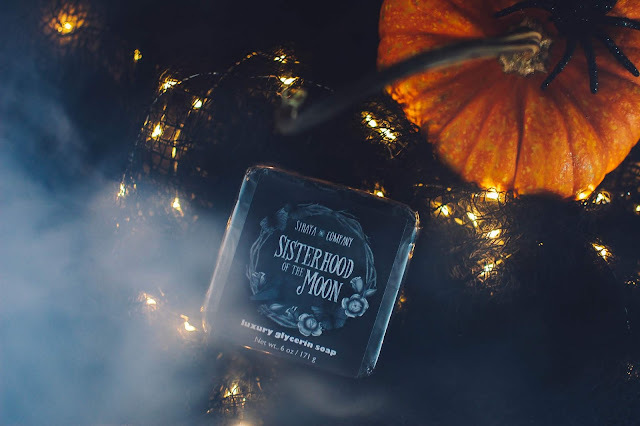 The Sisterhood of the Moon box from Sihaya & Co is my favorite box of the season. I picked this box up last year and reviewed it here. 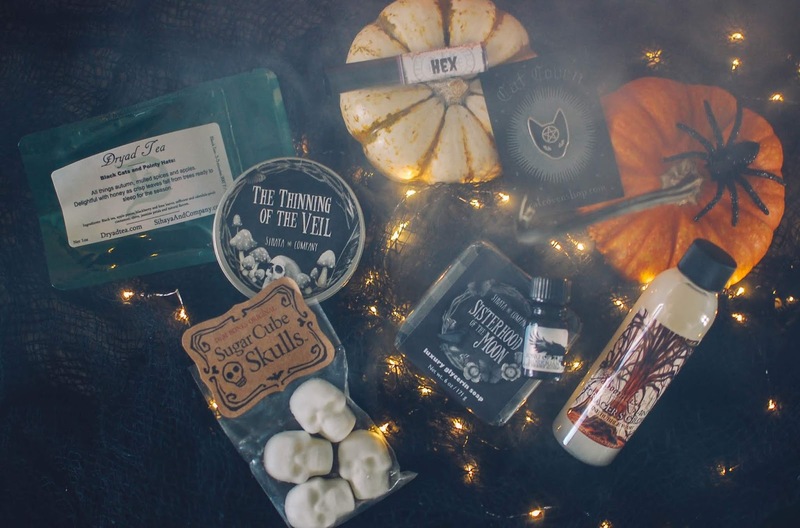 This year's box is just as wonderfully wicked. The box was $65 and sold out pretty fast. Dryad Tea in Black Cats and Pointy Hats ($6.50 for 1 ounce) along with the Sugar Cube Skulls from Dem Bones ($3) are repeats from last year's box. 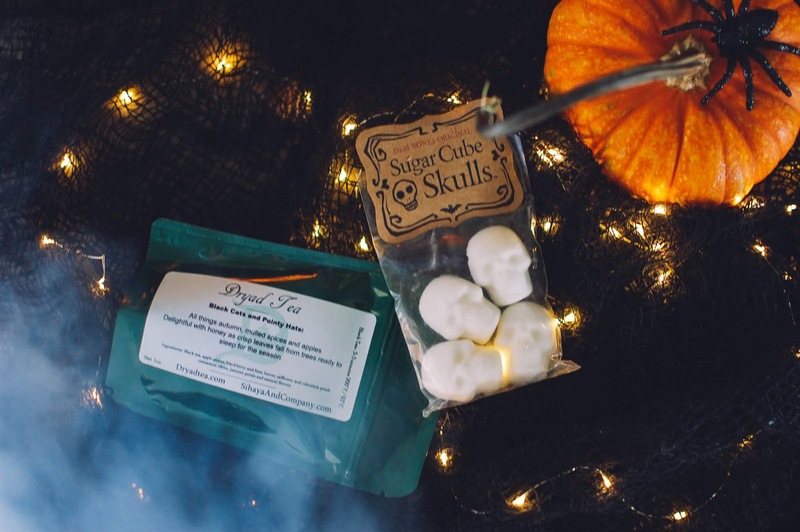 The tea is a festive and smooth spiced apple black tea with fruity notes and the sugar skulls dissolve easily and one skull is perfect for sweetening up one cup. 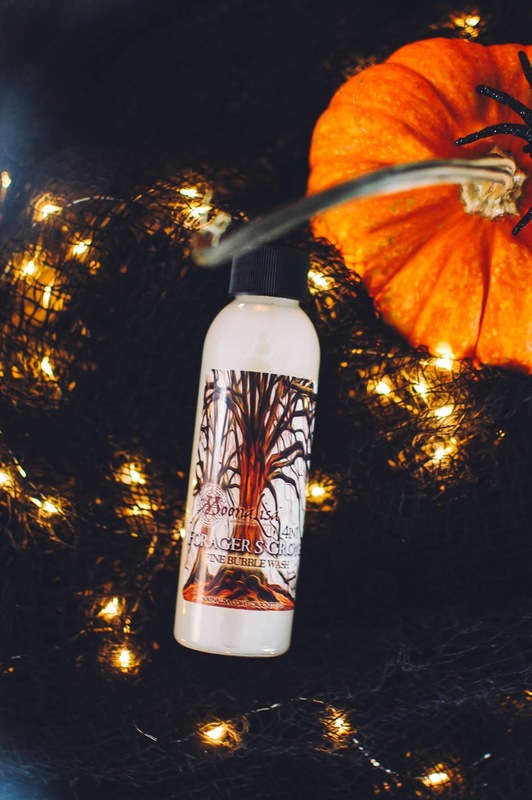 Moonalisa 4IN1 Fine Bubble Wash in Forager's Grove ($6.95) was a very pleasant surprise. This 4 ounce bubbling wash can be used as a shampoo, shower gel, bubble bath or fabric cleaner. Forager's Grove includes dank woods, balsamic aromas of resinous twigs and leaves, toasted sugared wild blackberries and roasted coffee. Plump blackberries with crystal droplets of juice shining under their bellies sit next to a steaming mug of coffee. The coffee and blackberry mixture is tempered by the resins and moves it from foodie to gourmand. The amber backdrop along with the dark berries and subtle coffee truly do make for an autumnal aroma. I used this Bubble Wash in the bath tub for a few nights in a row and it gave birth to the fattest mountain of white bubbles and smelled amazing. It made for some very nice full moon bubble baths, indeed. Sihaya & Co and Paintbox Soap Works have collaborated with products and fragrances lately and the combo has been exciting. One of the results is this fabulous Paintbox Soap Works glycerin soap scented in Sihaya's fragrance Sisterhood of the Moon ($6) which blends amber, crackling fires, woody oakmoss and warm vanilla. I unwrapped this soap and used it immediately. It is my new fall time favorite. The glycerin soap is bouncy and smooth and lathers up with a nourishing richness. There is a fine silver teal mica within the dark soap, making for beautiful gazing. The scent is just as good as I remember it from the candle. It is a surprisingly sweet resinous scent. I almost feel like there is the barest hint of leaves and stewed autumn fruits within the ember and amber and sugar. It is incredible. Happy to bathe with it. 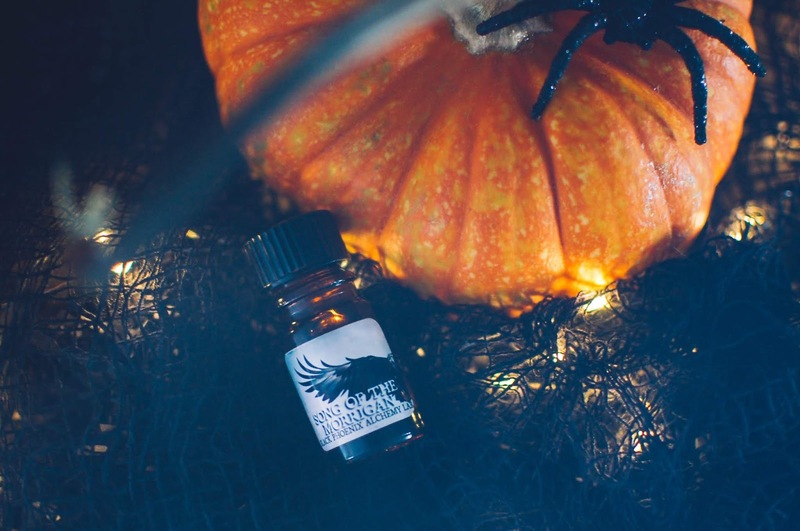 Black Phoenix Alchemy Lab contributed a 5 ml perfume ($26) to the box. Song of the Morrigan- Notes: Dusky patchouli, bone-white Hojari frankincense, rose thorns, rue and mugwort. From the bottle, Song of the Morrigan whispers with a breath of herbs, dried and fresh, earthen and pungent. Tarragon and wormwood twine with sanguine rose petals and patchouli. A heady and primal aroma. Anointed on the skin, the herbage surfaces in the same manner as from the bottle, green with sap and life. It expands into a golden green haze of woody absinthe and powdery frankincense all while holding onto the spirit of the loam. As it dries down it mellows with faint tonka sweetness. It is a haunting scent. Sihaya & Co always tucks a candle inside their seasonal boxes and I always look forward to using it. 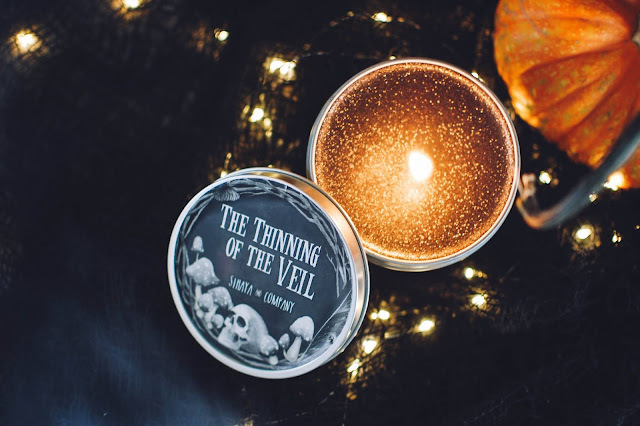 This year's Sisterhood of the Moon box candle is The Thinning of the Veil ($12) and it comes in an 8 ounce tin. The Thinning of the Veil- Notes: Carved pumpkins, smoky oudh, black amber and smoldering dragon's blood resin. 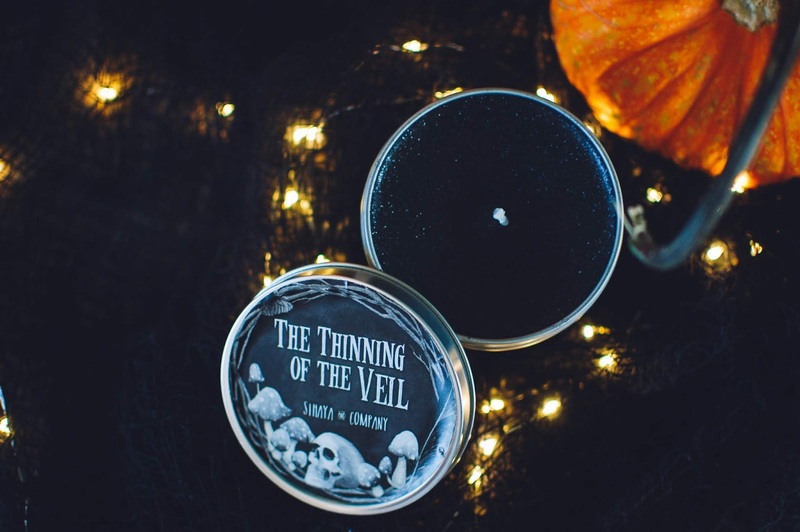 This candle is amazing. It just might be my favorite Sihaya candle to date. It is smoky and dark and full of ominous shadows. The oudh and resins make up the corporeal portion of the scent while the pumpkin offers just a wisp of a spirit to sweeten and lighten the darkness just a smidgen. The throw is excellent and it scents my whole bedroom. It burns will with no tunneling and a strong flame. There was also a purple shimmer lipgloss from Apocalyptic Beauty in the shade Hex ($12), which is a liquid lipstick with a violet hue and red shimmer. The lipstick has a pleasant violet/grape/anise aroma to it. It feels plush on the lips when applied then dried into a matte finish. The shade is more flattering on my lips than I assumed it would be. I would probably apply a gloss on top because my old lady lips don't take to matte finishes well at all and it feels a touch drying. I will be happy to use this lipstick on fun occasions. An enamel black cat pin from Cat Coven ($10) was curled up on the bottom of the box waiting to be adopted. Sihaya & Co curates wonderful seasonal boxes. This box is valued at around $82.50 so it is a nice deal. The winter box is going to be incredible. 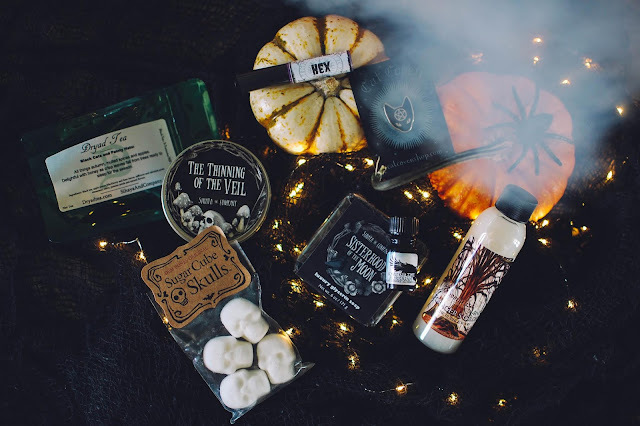 The theme is hygge and will include Black Phoenix Alchemy Lab, Haus of Gloi, Immortal Mountain, Latherati, Lumina Noctis, Sydney Grace and Sihaya & Co. It will go on sale November 1st at 9am EST (first 25 boxes) and then a 7pm EST (the remaining 25 boxes) for $67 each. These will ship at the end of November. Are you ready for some winter hygge? Some comfort and joy? Back in high school and college, going to Universal Studios Halloween Horror Nights was the thing to do to induce peeing of the pants. My girlfriends and I or Adam and I would wait an hour to two in line in order to enter frightfully orchestrated haunted houses that usually had a theme from a movie or show or myth. The jump scares are what always sent me a hollering. I am still easy to scare with a sudden touch on the shoulder or unexpected noise. I love the aesthetic of a run down gothic haunted house. And real abandoned places lure me in. Do you have any haunted house experiences? Hey, look at that, Moonalisa is still doing their thing; that's nice to see. Even nicer that it's such a nice product. Also, I love that candle so much. I saw the pics you posted on IG - it looks like it's filled with tiny fireflies, so pretty! Yeah! I was surprised to see Moona in the box. But it was pleasant. I enjoyed the scent and the baths that resulted from it so I hope I can track some more down one day. I love how you put that candle description, fireflies <3 so perfect. Those boxes always sound like such glorious seasonal indulgence. Ahh! They really are a nice treat. And they would make nice gifts too. I saw the teasers for the hygge box and some of the scents sound just like something we would like. Lots of warm ember scents. Do you have something special in mind for holiday gifting this year? Me too. I finally picked up a few things for the girls and family members but I am way behind. Indie makeup would be fun! Like make her a cosmetic bag full of goodies? Or a muji drawer with it in there? How cool! Were you able to snag a candle? I need major help with what to buy my husband. He never really wants anything but socks. Boo. I am also stuck on a few things here and there. I was able to get a candle for my mother and one other one for one of my sisters. :) The site was a little goofy for me, but I made it through and got everything I wanted. I was delighted there wasn't a site shutdown or any big issues like the last opening. Hope the projected December 1 opening is also smooth. YAY! Glad you were able to get a candle!! I did some serious damage. I bought a ton of wax. And it will be my last order for a good long time. So that makes me feel less bad. I will blog it as soon as I take photos. How funny!!! Secret Santas are fun! What a cool idea to do with the family!